91. 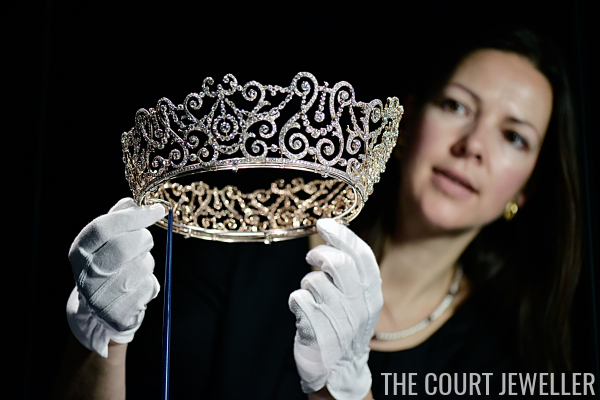 The Teck Crescent Tiara: This tiara, made of three diamond roses and twenty diamond crescents, was made using elements inherited by the Duchess of Teck from her aunt, Princess Mary, Duchess of Gloucester. The various elements of the tiara can still be detached and worn as individual ornaments. The Duchess of Teck bequeathed the tiara to her son, Prince Adolphus, but by 1937, it had made its way to the jewelry box of the Queen Mother. (Hugh Roberts speculates that Queen Mary was, of course, involved somehow.) While the Duchess of Teck often wore the tiara with two extra rows of diamonds at its base, today it is a simpler tiara. After inheriting it from her mother in 2002, the Queen loaned it to the Duchess of Cornwall. It hasn't been worn in public since 1939, but it was photographed for The Queen's Diamonds in 2012. 92. The Delhi Durbar Tiara: This enormous diamond tiara was made by Garrard for Queen Mary to wear at the 1911 Delhi Durbar; it was originally topped with several of the Cambridge emeralds. In 1947, Mary loaned the tiara to the Queen Mother for the royal tour of South Africa, and it remained in her jewelry box until her death in 2002. This piece has also been loaned to the Duchess of Cornwall, who wore it in 2005 during a state visit from Norway. 93. The Greville Tiara: This diamond and platinum tiara was made by Boucheron for Mrs. Greville, who left it to the Queen Mother as a part of a large jewel bequest in 1942. 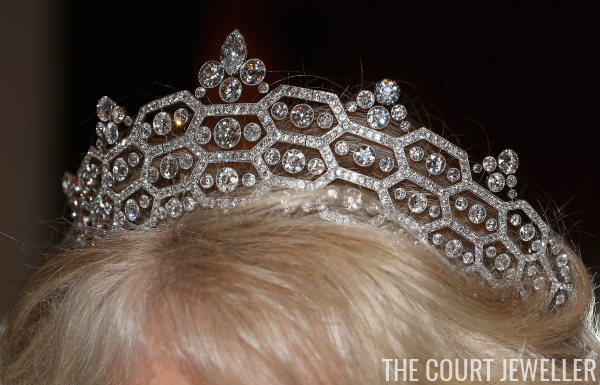 After tweaking the shape just a bit, it became one of the Queen Mother's favorite tiaras. In 2005, the Queen loaned it to her daughter-in-law, the Duchess of Cornwall, who has also made it one of her favorite sparklers. 94. The Strathmore Rose Tiara: Pretty and delicate, this diamond tiara was the Queen Mother's wedding gift from her father, the Earl of Strathmore and Kinghorne, in 1923. The piece came with two frames, so that it could be worn either atop the head or across the forehead. She wore it frequently during her early royal years, but it hasn't been worn in public by anyone for over half a century. The Queen inherited the tiara in 2002, and it was photographed ten years later for The Queen's Diamonds. 95. Queen Alexandra's Wedding Necklace: We've already talked about two other pieces from Queen Alexandra's wedding gift parure -- the earrings and the brooch, which the Queen inherited from Queen Mary in 1953. But Mary presented the matching necklace to the Queen Mother, who wore it regularly up until her death in 2002. The diamond and pearl necklace was photographed for The Queen's Diamonds in 2012, but the Queen has not yet worn it in public (or loaned it to any other family members). 96. The Greville Festoon Necklace: There are necklaces, and then there is the incredible diamond festoon necklace from the Greville bequest. The Queen Mother inherited this Cartier-made piece from Mrs. Greville in 1942; she usually wore only three rows of the necklace at a time. The Queen inherited it in 2002 and loaned it to the Duchess of Cornwall in 2005. 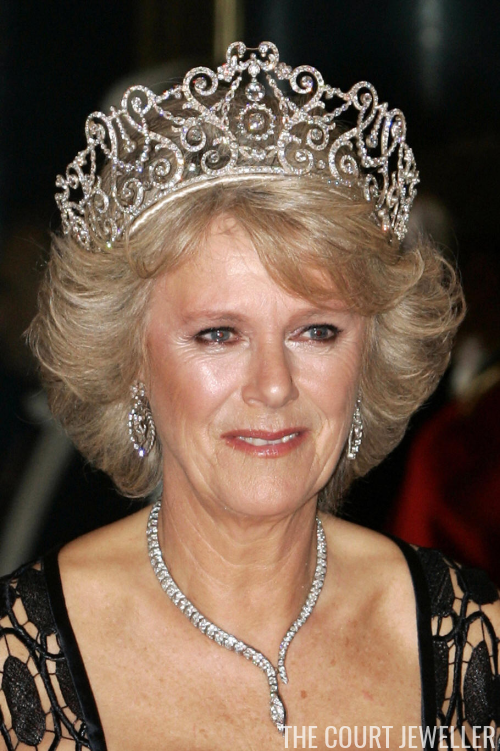 Camilla, who can wear large pieces of jewelry better than anyone else in the family, has usually chosen to wear the complete necklace, often with the Greville Tiara. 97. The Love Trophy Collar: This intricate diamond choker necklace was made for Queen Mary in 1901, when she was still the Duchess of Cornwall and York. Its design features several symbols that represent love, including bows, quivers of arrows, and torches. Mary passed the necklace along to the Queen Mother in the 1920s or 1930s, but it wasn't really the Queen Mum's style, and she never wore it in public. Ditto the Queen, who inherited it from her mother in 2002, although she did allow the piece to be extensively photographed for The Queen's Diamonds in 2012. I'm really hoping that this piece is earmarked as a jewelry loan for the Duchess of Cambridge. 98. Queen Adelaide's Diamond Fringe: In the photo above, Queen Mary is also wearing of the oldest pieces of wearable jewelry in the royal collection -- the diamond fringe that was made in 1831 by Rundell and Bridge for Queen Adelaide, the wife of King William IV. You'll sometimes also see it referred to as the George III or Hanoverian Fringe, and people are forever confusing it with Queen Mary's Fringe Tiara. Queen Adelaide's fringe was constructed to be convertible, and various queens have worn it as a tiara, a necklace, or even a girdle ornament (see the portrait of Queen Alexandra at her coronation). In 1936, Garrard adjusted the piece to be worn specifically as a necklace by Queen Elizabeth (the Queen Mother). Queen Victoria designated the fringe as one of the heirlooms of the crown, but when King George VI died in 1952, this piece remained in the Queen Mother's jewelry box. 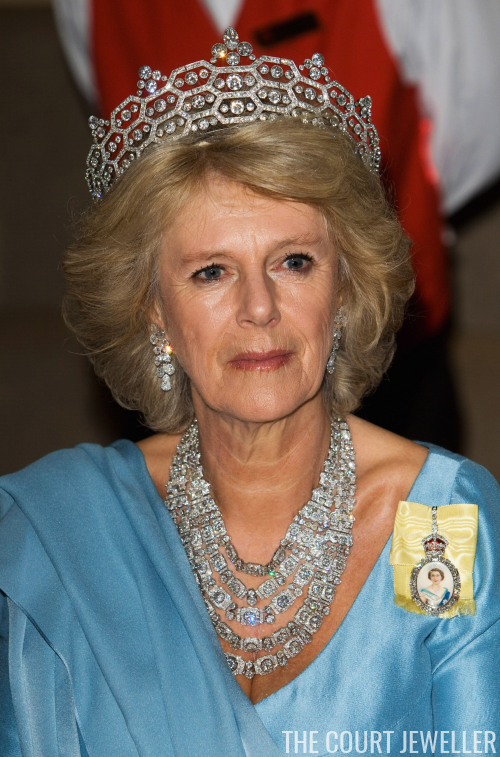 She bequeathed the necklace to the Queen in 2002, and it was photographed in 2012 for The Queen's Diamonds, but it hasn't yet been worn in public. 99. The Greville Bow Brooch: Boucheron made this dramatic diamond bow brooch for Mrs. Greville around 1900. She passed it along to the Queen Mother in 1942, but she didn't wear it often -- Hugh Roberts suggests that its very large dimensions make it difficult to wear. (You can see just how big the brooch is in the photo above; it's pinned to the Queen Mum's shoulder, just peeking out over her wrap and flowers.) The Queen inherited it in 2002, and it was included in Roberts's book in 2012, but no one has worn it in public in decades. 100. The Sapphire and Diamond Fringe Earrings: Like the rest of the Queen Mother's jewels, the Queen inherited these sapphire and diamond fringe earrings in 2002. In 2015, she loaned them to her granddaughter-in-law, the Duchess of Cambridge, who wore them at a gala at the Victoria and Albert Museum in October 2015.